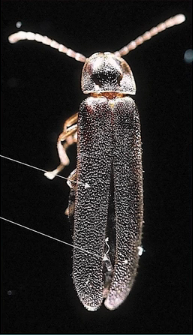 What makes Blue Ghost Fireflies different from other fireflies? It really comes back to their biology. Only the male blue ghost can fly. The female blue ghosts have no wings. In fact, the female bodies are transparent. You can actually look through them and see the organs on the inside of their bodies, and thet still have the larva shape. Where can you find Blue Ghost Fireflies? 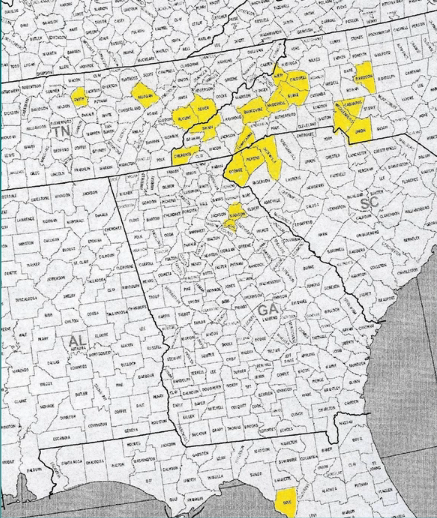 Southern Appalachia is the main area where they are found. What type of area should I look for to find Blue Ghost Fireflies? To find blue ghosts, look for an area that is forrested, has deep leaf litter, and is moist. Finding an area that in on a north-facing slope with a stream is the perfect habitat for them. Female Blue Ghosts live in the moist leaf litter, so blue ghosts have to have leaf litter in order to survive. Since only the males fly, it is very very hard for blue ghosts to recolonize an area once their habitat is destroyed. When can you see the Blue Ghost Fireflies? They typically are most active in Late May to early June. This is the time males are flying around looking for females. They are communicating through light. May 15 – June 15 is the typical time frame for viewing, but recent trends have them coming out sooner. They are senstitive to the temperature of the ground. Warmer temperatures can lead to an earlier mating season. 9:30-10:00 PM is the peak viewing period. You need to be out there right as it gets dark. Weather will affect the viewing of Blue Ghost Fireflies. They can not fly when there is a heavy rainstorm. They can be drowned if heavy rain hits during peak activity hours. But they are even more adversely affected by times of drought. A decrease in rainfall in April and May drastically reduced the amount of Blue Ghosts that we see. 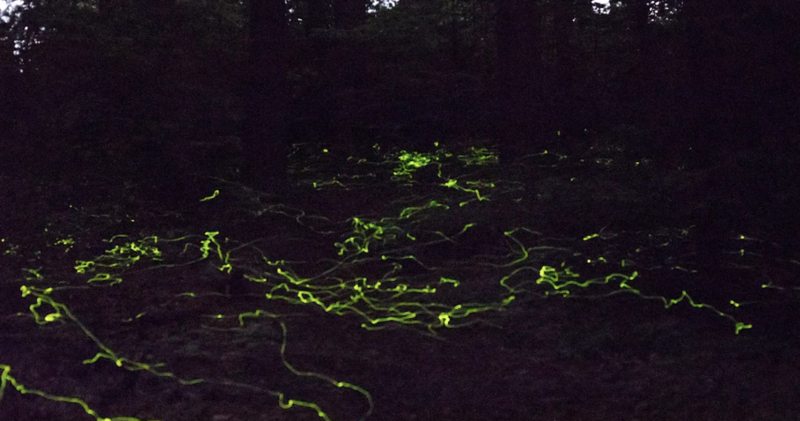 Is DuPont the only place to see the Blue Ghost Fireflies? No, they can be seen throughout the region. With the growing popularity of Blue Ghost viewing, DuPont has restricted the number of people on its trails at night in order to protect Blue Ghost habitat. Spreading out the areas in which people are viewing Blue Ghosts is the best way to preserve their habitat. It is recomended to go camping in an area without many people around as a way to have a Blue Ghost experience. We hope you’ll get out to find some and share in the magic of the experience!